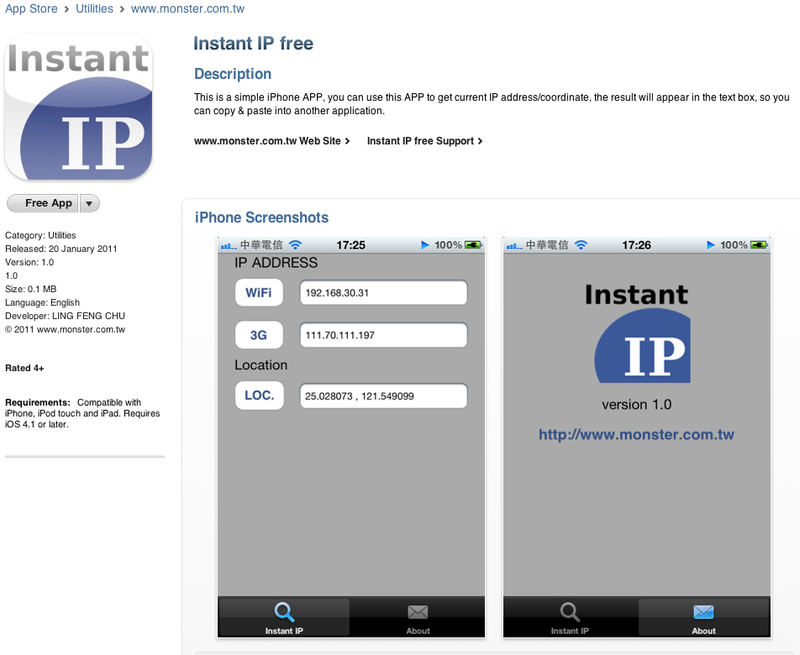 This is a simple iPhone APP, you can use this APP to get current IP address/coordinate, the result will appear in the text box, so you can copy & paste into another application. 這是個簡單的 iPhone APP , 用來立即查詢 iPhone 目前拿到的 IP address , 還有座標, 查詢後資料在文字框顯示, 方便使用者剪貼到別的應用程式去. OK, 這個 iPhone APP 已經可以在 app store 上搜尋得到囉! 所以今天開始(2011.0120)我也成為iPhone APP的作者了, 感謝我的老闆(神奇傑克)的指導, 也請大家多捧場他寫的 iPhone APP ( 逛露天 iPhone / Android 雙平台).